The Holy One says this: “I live in the high and holy place” (Isaiah 57:15). 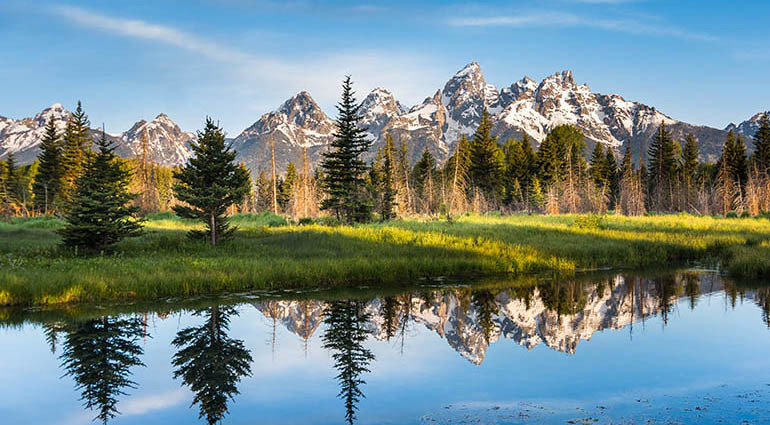 The Grand Teton Mountains in Jackson Hole, Wyoming, offer one of the most spectacular views in all of the United States. Geologists believe the mountains there might have formed as a result of several earthquakes along a fault line. They believe earthquakes caused the land to drop on one side of the fault but move upward on the other side. Looking up from the lower side provides a unique and magnificent view where no foothills block the sight of the mountains. God gave the Israelites a clear view of His majesty through the prophet Isaiah. He described Himself as “the high and lofty one”—the Holy One who lived in “the high and holy place” (Isaiah 57:15). 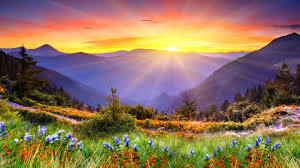 This picture of God’s utter perfection was designed to show His people that He was greater than the idols they were passionately pursuing (Isaiah 57:5-10). Sadly, their devotion to God was often outweighed by their devotion to powerless idols, which couldn’t even stand against a “puff of wind” (Isaiah 57:13). Although God’s holiness meant He was far above His people and the little gods they adored, it didn’t prevent Him from showing mercy to those who renounced their misplaced worship. He told them, “I restore the crushed spirit of the humble and revive the courage of those with repentant hearts” (Isaiah 57:15). Despite their past sin, God wanted to forgive His people and be close to them again. C. S. Lewis said, “[God] will have us even though we have shown that we prefer everything else to Him, and come to Him because there is ‘nothing better’ now to be had.” A glimpse of God’s holiness shows us that there truly is nothing better to be had. Today, may we accept His mercy and “worship the Lord in the splendor of His holiness” (Psalm 29:2). It’s not uncommon to see some familiar heroes come back to the silver screen. Sylvester Stallone was back in action as Rambo, reprising his role from over 20 years ago. And Harrison Ford dusted off his flying skills and reintroduced Han Solo and Star wars to a new generation of fans. There’s something about our longing for a powerful figure to solve the problems of the world and to restore justice and harmony to mankind in a way that captures our hearts and imaginations. Of course, getting the job done takes them about two hours on the silver screen, but in real life it’s a different deal. Thankfully, in real life there is a “real hero.” Not the “two-hour” kind, but the kind of hero that ultimately gets the job done in a way that settles the issue of life finally and forever. I’m sure you’ve guessed it: I’m talking about Jesus. In fact, according to the prophet Isaiah, He has several names, all of which describe His capacity to finish the task and to satisfy the longing of our souls for life as it ought to be. Among these compelling names, Isaiah includes the name, “Mighty God.” Jesus is the ultimate of heroes, infinitely strong and eternally mighty. But that extends far beyond bulging biceps and quick-trigger fingers. In fact, in the original language this name meant something far more specific. It’s the name El-Gibhor, the warrior God, the hero who will always prevail. It’s the name for God used in the song of Moses found in Exodus 15. The Israelites have just seen God at war. He has brought a series of 10 miraculous plagues to Pharaoh—plagues that each, by the way, debunked a specific “god” of the Egyptians. To the Egyptians who worshiped a frog god, the warrior God brought hordes of frogs. It’s kind of like He said, “You like frogs? Watch this!” And the Egyptians worshiped the Nile, so the warrior God turned it to blood. And now Moses and the people are singing because this warrior God, El-Gibhor, has allowed His people to cross the Red Sea on dry land before pouring the waters over the pursuing Egyptian army. So take heart today, He is our Mighty God! He is never at a loss, never overwhelmed, never surprised, never defeated, and never ashamed. You and I may feel powerless, helpless, and even hopeless at times, wondering if there is anyone who can rescue us. But in the midst of it all, Jesus is our ultimate hero! So we can confidently say, “The Lord is my helper; I will not be afraid. What can man do to me?” (Hebrews 13:6 ). This world is not the place of punishment for sin; not the place; it may sometimes be a place, but not usually. It is very customary among religious people, to talk of every accident which happens to men in the indulgence of sin, as if it were a judgment. The upsetting of a boat upon a river on a Sunday is assuredly understood to be a judgment for the sin of Sabbath-breaking. In the accidental fall of a house, in which persons were engaged in any unlawful occupation, the inference is at once drawn that the house fell because they were wicked. Now, however some religionists may hope to impress the people by such childish stories as those; I, for one, renounce them all. I believe what my Master says is true, when he declared, concerning the men upon whom the tower of Siloam fell, that they were not sinners above all the sinners that were upon the face of the earth. They were sinners; there is no doubt about it; but the falling of the wall was not occasioned by their sin, nor was their premature death the consequence of their excessive wickedness. Let me, however, guard this declaration, for there are many who carry this doctrine to an extreme. Because God does not usually visit each particular offence in this life upon the transgressor, men are apt to deny altogether the doctrine of judgments. But here they are mistaken. I feel persuaded that there are such things as national judgments, national chastisements for national sins—great blows from the rod of God, which every wise man must acknowledge to be, either a punishment of sin committed, or a premonition to warn us to a sense of the consequences of sins, leading us by God’s grace to humble ourselves, and repent of our sin. For meditation: Reflect and pray over the state of the nation and its standing before God (Proverbs 14:34). This entry was posted in aging, Children, Devotion, Family, Health, Inspiration, Inspirational, Marriage, Mental health, Trust, Wellness and tagged ebay, exercise, facebook, Fitness, flights, God., grace, Health, hot, hotels, inspiration, Jesus, jobs, marriage, mental health, music, net flix, nutrition, pray, prayer, Recipes, relationships, salvation, Skin, Sports, supplements, translate, travel, vacation, walmart, weather, Wellness, wine on October 6, 2018 by simposiousadmin.